Himmafushi Island is home to one of the best surf spots in the Maldives – Jailbreaks. This famed right hander sits just a short speedboat ride North of Male airport and is also the best budget Maldives surf spot I’ve discovered on my travels around the Maldives. 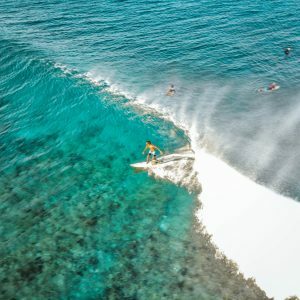 So if you want to score some incredible waves, in clear warm waters and surrounded by the tropical islands of the Maldives here’s everything you need to know about Himmafushi – from how to get there and where to stay to the best surf spots on offer and most importantly how much everything costs! Himmafushi Island is one of the closest Maldives local island to the airport and Male city, meaning it’s quick, easy and pretty cheap to get to. With it’s proximity to Male Himmafushi has a good range of accommodation options to choose from – including guest-houses, small hotels and of course a good handful of surf camps too, so there’s something for every style and more importantly budget. As my trip to Himmafushi was purely for the surf I joined the team of Jailbreak Surf Inn as they offered the best budget surf package I’ve found in the Maldives, which I highly recommend! Even if you’re not surfing they’re great value for money and the in-house food is on point. 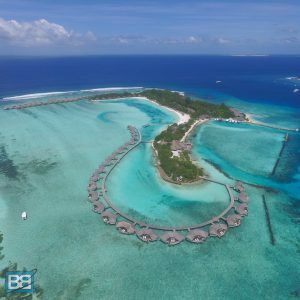 Did you think the Maldives was all tranquil waters and lagoons – well it also has some absolutely pumping surf spots and this is the main reason I actually headed to Himmafushi! Jailbreaks – this is the main break of the island, named after the fact it’s right in front of a jail and until recently it was actually illegal to surf there (as the entrance was on private property), but now it’s no worries! the reeling right hand point/reef break offers some long rides and fast barrel sections. If you’re getting to the break from the land make sure you pack your reef booties. Sultans – across the channel from Jails this spot is for those who want something a bit bigger and challenging this is the spot and it’s certainly not one for beginners or low end intermediates unless the swell is small! Handling some solid size get prepared for some awesome tube rides. Breaking anywhere from 4 foot up it really starts to come into its own at 8 foot plus, however with this sizeable perfection often come the crowds and it’s a favourite with surf charter boats in the area too. Honkeys – next to Sultans is Honkeys, a left hander. Although not as consistent or as long a ride as Jails or Sultans if you’re goofy footed you’ll want to give this a bash too! Jailbreaks – A Perfect Right On Your Doorstep! And further field there are some other epic waves you might want to check out too, although if you want to spend some serious time on these waves I’d suggest basing yourself on Thulusdhoo instead. Ninjas – a slightly more mellow break (also referred to as Piddlies) Ninjas is one of the more beginner friendly and longboard friendly waves in the area and is best surfed at 4 foot and under and breaks much slower than most of the waves in the area. Perfect for learning and cruising! Cokes – one of the most famous surf breaks in the Maldives this right hander is very similar to Jailbreaks actually, although slightly faster on the right swell. Well worth checking either as a day trip from Himmasfushi (it’s about $80 on a private trip) or if you want to spend some more time on this wave you can also stay on Thulusdhoo. Chickens – goofy footers rejoice, there’s also an epic left hander in the Maldives too!haha! This wave is more forgiving than Cokes and Jailbreaks, but dont be fooled, it can still handle some serious size and has some great barrel sections. Situated on the opposite side of the channel from Cokes. 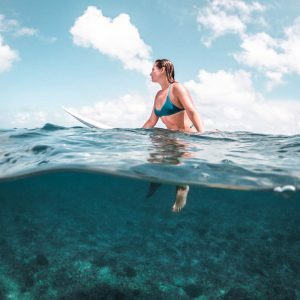 I know not everyone is looking to go surfing in the Maldives and that exploring the local islands is the best way to travel the Maldives on a budget, so here are a few options for non surfing activities you can fill your time will. To be honest most local islands offer a similar set of things to see and do – so if you’re island hopping between a few spots in the Maldives make sure you spread them out! Tourist Beach – the islands tourist beach is the perfect place to top up your tan and the only bit of sand where you can get away with bikinis and boardies only. It’s something the local Maldivian Islands have implemented to appease both the religious aspect of the country, but also the demands of tourism. Why Not Enjoy Some Luxury For The Day?! Dolphin Watching – the ocean all over the Maldives are home to heaps of dolphins and the local spinner dolphins are always keen for an awesome show of aerial acrobatics! Although not guaranteed to see them it’s still a fun day cruising around the islands and perfect for those who don’t wang to get wet. Snorkelling Day Trip – discover more of what lies beneath the waves on a snorkel day trip to one of the local reefs where you chill with turtles, schools of fish and even find Nemo! Sand Bank Trip – perfect on a sunny, flat day you’ll enjoy lunch non a sand bank in the middle of the ocean, perfect for some tropical Maldives holiday snaps. Scuba Diving – although the scuba diving around Himmafushi isn’t as great as the diving on Fulidhoo there are still plenty of dive sites to explore in the area and the island has a couple of well established dive centres (such as Feena Dive) who will show you the underwater world. 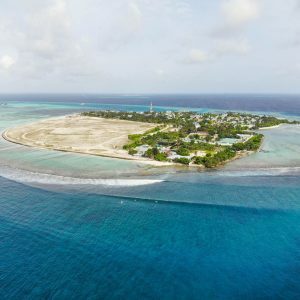 Resort Day Trip – in actual fact one of the main resorts they use for these days trips is Cinnamon Dhonveli, which I stayed at on a previous surf trip to the Maldives and is perfect for a cold cocktail over looking the famous Pasta Point surf break! Honestly though if you’re not looking at surfing and want a local island experience I would recommend Thulusdhoo or Fulidhoo or even Maafushi over Himmafushi as they are definitely more tropical in appearance and also have a better range of accommodation options (including sea front options). Out of the three Fulidhoo would definitely be my top pick as it’s much smaller and laid back. So how much should you budget for your stay on Himmasfushi? Your accommodation is going to be your biggest cost (which is pretty much the case anywhere in the world!) so where you end up staying will have huge impact on how much Himmafushi costs you. The best time of year to visit Himmasfushi (and the Maldives in general actually) is really going to depend on your reason for heading this way. Are you going to Himmafushi to surf, or because you want to visit a local Maldives island? If you want a mix of surf and sunshine then March is the best bet with the shoulder season having the start of the seasons swells and the end of the good weather too – ideal if you’re travelling with anyone who doesn’t surf! With an average monthly temperature of 28 degrees you’re not going to go too wrong whatever time of year you head to Himmafushi, but be aware in peak swell season you could get caught out with a few tropical storms. As with all local island in the Maldives it’s worth double checking the dates for Ramadan (the Muslim fasting holiday) as all local restaurants will be shut during day light hours. Hotels and full board options at guest houses will mean you can still eat, but options are definitely more limited. When it comes to how long the stay on Himmafushi – for surfers the longer you stay the better your chance of scoring epic waves. For me 7 nights was ideal (and we had pumping surf all through our stay in July) and given the fact it’s so budget friendly Himmafushi is on point for those wanting to hit the waves for a longer period of time. For non surfers though it’s really a couple nights tops or skip it in favour of some other more tropical local islands. For surfers, Himmafushi is a pretty incredible part of the Maldives – with some epic waves on your doorstep and some budget Maldives surf camp packages which allow you to make the most of the local surf spots without smashing your budget. It’s also a great island to combine with Thulusdhoo if you want to sample even more surf spots. If however you’re not surfing in the Maldives islands like Thulusdhoo and Fulidhoo do offer a slightly more tropical setting to your Maldives trip and for those wanting something close to the airport with plenty to do and equally budget friendly Maafushi is also another option to consider. I’ll certainly be back with my board in tow sometime soon! Have you hit up Himmafushi for surfing or simply exploring? Any tips, costs or advice you’d like to share?